A traditional Holy Saturday choral celebration of Tenebrae will be held at Washington’s St. Thomas Apostle Church on Saturday morning, April 4, at 9:00 am. The service will include the traditional morning offices of Matins and Lauds sung in Gregorian chant. Good Friday services will be held at midday on Friday, April 3, at the Traditional Latin Mass Congregation of Silver Spring, Maryland. Reverend Father Jacob Straub of the Diocese of Covington will lead Stations of the Cross at 12:15 pm, followed by the Sacred Liturgy of Good Friday at 1:00 pm. Confessions will be heard beginning at 11:00 am. A Sung Mass celebrating the Feast of the Annunciation of the Blessed Virgin Mary will be offered at Washington’s St. Thomas Apostle Church on Wednesday morning, March 25, at 7:00 am. Both the ordinary of Mass XVII and propers of the feast day will be sung in Gregorian chant. 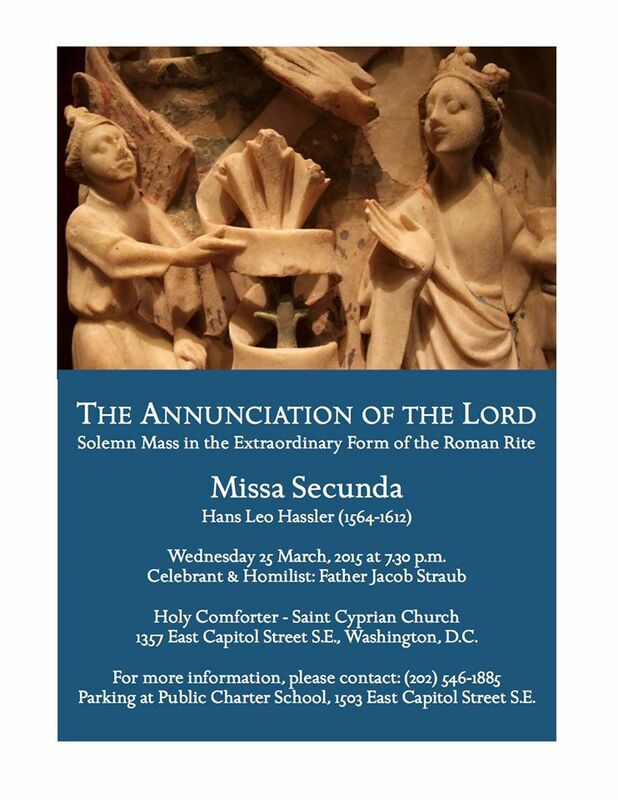 The Georgetown Traditional Latin Mass (Extraordinary Form) Community announces that a Missa Cantata will be offered Friday, March 27, at 6:30 pm in Copley Crypt Chapel at Georgetown University. Reverend Father Stephen Fields SJ will be the celebrant of the Mass of the Feast of St. John Damascene. A relic of the True Cross of Jesus Christ will be made available for veneration on March 27 at Our Lady’s Center in suburban Baltimore. The relic will be displayed after the Center’s noon and 7:30 pm Novus Ordo Masses. On each occasion, veneration will be followed by Adoration of the Blessed Sacrament, Confessions, and Stations of the Cross. The Traditional Latin Mass (Extraordinary Form) will be offered at the following times on Monday, Wednesday, and Saturday of this week by Reverend Father Richard Carr at St. Michael Church, 7401 St. Michael’s Lane, Annandale.